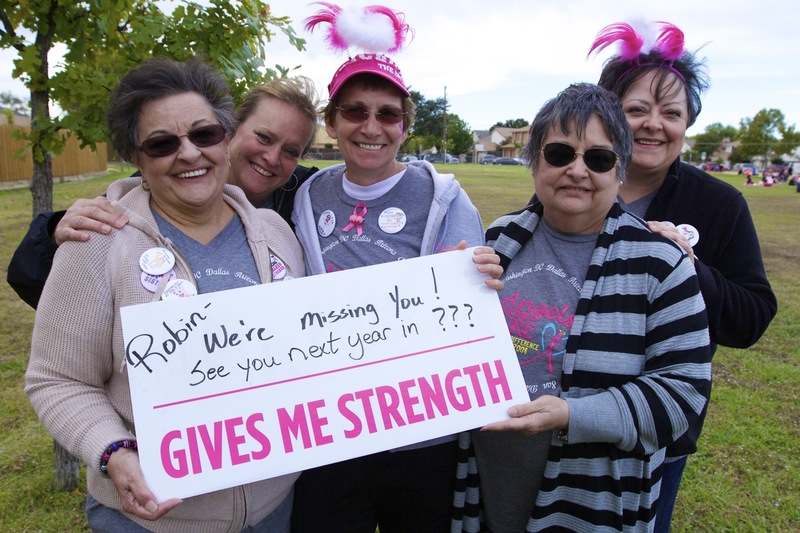 The Susan G. Komen 3-Day® community is known as a warm, welcoming family, embracing new participants and nurturing relationships with vets and newbies alike. It’s also not uncommon for actual families to participate together, usually in honor or in memory of loved ones. At the Komen 3-Day in Dallas/Fort Worth this year, I had the pleasure to meet a couple of these families and hear about how the 3-Day® has impacted their lives. The Dallas/Fort Worth walk this year is Kristi’s fifth walk (she’s also crewed and volunteered). 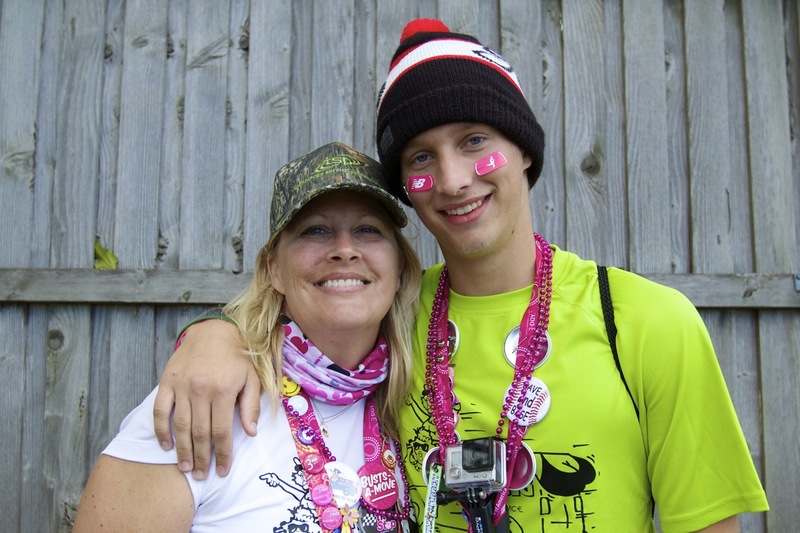 She walks not only in memory of her dad and in honor of her sister who was diagnosed in 2006, but also for her other sister who battled breast cancer just last year. This year’s event has another special importance to Kristi’s family: her 17-year-old son, Eli, is walking alongside her for the first time. Not long after talking with Kristi and Eli, I heard another remarkable example of how the 3-Day brings people together. Renee R., a Dallas-area local, has been walking in the 3-Day for six years, two cities each year (and three in 2013!). Renee has five sisters, who are spread out all over the country, and although she first got involved with the 3-Day as a way to honor her sister Robin—a stage IV survivor who lives in Las Vegas—it was her relationship with her youngest sister, Jill, that was profoundly affected because of the 3-Day last year. Renee describes her family as “a blended family that didn’t stay blended.” But as she prepared to travel to Chicago last year, Renee came across Jill’s email address, hidden within a group message to the whole family. and sent her a message: “I wrote, ‘If I walk the 3-Day in Chicago, will you consider having lunch with me?’ And she said ‘no, I want more than that.’” So Renee and two of her other sisters—Linda who lives in Pennsylvania, and Robin from Las Vegas—met up with Jill in Chicago as well, and four of the six the sisters were reunited for the first time in decades. I marveled at how, despite all living so far from each other, five of the sisters were together here in Dallas. Renee assured me, “Now they want to follow me wherever I go to walk the 3-Day. So the 3-Day really brought us together.” Robin was not able to make the trip out from Vegas, but the other five women insist that they’ll get all six of them together eventually. In the meantime, they celebrate and honor Robin, as well as the oldest sister, Diane, who was also diagnosed in February. “The 3-Day brings people together. This is my pink family— ” Renee indicates her team, Angels for the Cure, who are sitting nearby—“We stay together during the off season, celebrate birthdays. But the 3-Day brought my actual family together too. If it wasn’t for the 3-Day, I wouldn’t have gone to Chicago,” Renee says, hugging Jill and filling that forty year absence as if no time had passed at all. Renee (center) and her sisters. Jill, her youngest sister whom she hadn’t seen in 40 years, is second from the left. ← What One Word Describes How You Feel Right Now?